In this video, we will be learning how to find the solution to an equation using direct substitution. For what value of x would make this equation true? Let’s go over finding the solution to an equation. Basically, we ‘re going to guess and check or use the answer given to us. This solution is what we’re going to use to know if our answer is correct.
. What’s the value of ? we’ll substitue into and see if that works. 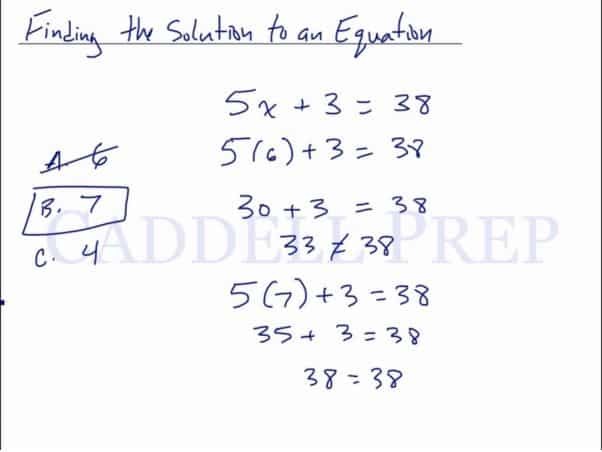 Let’s follow the order of operations to see if the equation on the left is equal . So that is not the answer. Let’s try next.